The opening track is a mid-tempo, guitar-driven track with a distinct and memorable riff, reminiscent of guitar riffs in songs like “Witching Hour” (New Religion 2010) and “Psycho City” (Crazy Lixx 2014). It was written by yours truly in the fall of 2016 and features some awesome guest backing vocals by Michael Palace (Palace) and John Elliot (Confess). The chorus is melodic with lots of thick harmonies and a flowing riff below the vocals, with guitars and bass playing in unison, which makes it stand out a bit from other choruses we’ve done. Lyrically it’s a bit of a “good girl gone bad”-story with a twist – I’m sure you’ll figure it out when you hear it. One of the harder songs on the album but still with a surprisingly melodic sing-along chorus that should probably stick after the first listen. The first of three songs that I custom wrote for “Friday the 13th – The Game” during the summer of 2016. This mid-tempo true 80’s hair metal tune is lyrically the most thematical since it’s directly about everybody’s favorite slasher villain; Jason Voorhees (the title XIII naturally referring to the number 13, in roman numerals). The song features one of my favorite riffs of the whole album and a really neat, spooky verse with some nice clean guitars and keyboard pads in the background. Chorus-wise it’s what you’d expect form one of these theme songs; melodic with a clear hook-line (“Ex triple eye – Friday night!”) and a cool memorable guitar / keyboard lick in between the vocal lines, which by the way are made massive by the excellent guest backing vocal performances by Swan Hellion (Black Rain) and Anders Ringman (Dreams in the Witch House). Some nice church organs in the post-chorus bridge makes the feeling complete. An overall catchy song that I suspect will become one of the fan favorites. A super guitar-solo by Chrisse Olsson on this one by the way, one of the best ones on the album in my opinion. OK, I’m gonna’ go out on a limb here and call this one the hit and over all fan favorite of this album. This song was actually a demo for both Riot Avenue (2012) and Crazy Lixx (2014) and was written just after the release of New Religion in 2010. So why was it never featured on an album then, you might ask. Is it because it’s not good enough? Well not really. The main reason it wasn’t among the songs we recorded for Riot Avenue back in 2011 was that it simply didn’t fit the style we envisioned for that album at the time (there were other demos scrapped from it for the same reason, for example “Girls of the 80’s”, which was later of course recorded for our self-titled album in 2014). When time came to record once more in 2014, Walk the Wire felt a bit dated and we quickly filled the track list with newer stuff we wanted to do (though the song was close to being picked for recording). Then last year, we started talking about potential songs to record for “Ruff Justice”, Jens Lundgren had of course joined the band by then and he quickly made it clear that Walk the Wire was his favorite Crazy Lixx song of all time and that it just had to be on the new album. Now, months later, hearing the result, I do have to agree with him. With it’s great melodic guitar solo, signed Jens Lundgren, a soft guitar- and keyboard driven sound inspired by Stage Dolls’ self-titled album from 1988 and some really outstanding backing vocals by Michael Palace (Palace) and synthwave starlet Kristine (Kristine) this is probably the song I’m the most satisfied with, production-wise. So what kind of a song is this? Well, let’s just say that if you enjoy songs like “Blame it on Love” (New Religion 2010), “Girls of the 80’s” (Crazy Lixx 2014) and “Children of the Cross” (New Religion 2010) I bet you’re gonna’ love this one. The fourth song of the album is special in at least two ways. First of all it’s the only song on the album that I haven’t at least co-written, but in fact it’s the first ever Crazy Lixx song that has been written by someone else but the band members. Second of all, it’s the only song that hasn’t been written on this side of the millennium, instead it was composed back in 1989. So what’s the deal here? Well, this song was originally on a demo album by an American band called Pretty Boy (no, not Pretty Boy Floyd) who later got signed with Bon Jovi’s management, changed their name to Mariah and then released a totally different album as their debut. So, basically, this song was never officially released (at least not until about 20 years later when it was released on CD by a small independent label in the US). I heard it a couple of years ago and immediately fell in love with its simple, youthful, 80’s hard rock style. I suggested it as a possible track for the new album and it became one of the last to be recorded for Ruff Justice, but I personally think it fits like a glove. In fact, up to now, whenever I’ve asked people if they notice something different about this track, no one has yet guessed that it’s not originally a Crazy Lixx song, even if it was composed way before any of us had even picked up an instrument. A straight forward hair metal song with an infectious gang vocal chorus that’s easy to shout along to and a style that’s reminiscent of our first two albums. This is the second song specially written for “Friday the 13th – The Game”. Quite different from XIII in many aspects, it starts out with an eerie plucked guitar part with a nice clean guitar solo and lead vocals over it, but a minute or so into the song the distorted guitars kick in and what seemed to be a sort of ballad quickly turns into a mid-tempo hair metal chorus featuring gang vocals by Swan Hellion (Black Rain) and Anders Ringman (Dreams in the Witch House). The tempo goes down again for the second verse but picks up towards the chorus and the consequent awesome guitar solo by Chrisse Olsson and carries on through to the end of the song. Musically it’s a bit hard to compare it with earlier Crazy Lixx stuff but if I’d have to I would probably say it’s a bit like a mix of “Children of the Cross” (New Religion 2010) and “Lock Up Your Daughter” (New Religion 2010). A solid, somewhat different, horror-themed hard rock song that I think fits like a glove into the mood of Friday the 13th. Track number 6 is probably the grooviest song on the album with a distinct, off-beat hi-hat drum beat and borderline funk metalesque guitar riffing. It’s a pretty straight forward, yet energetic rock song with that classical “man-eater” theme in the lyrics. The song contains one of the coolest breaks on the album in my opinion, a cool melodic riff part that ends with a quick guitar solo before kicking off the final chorus. Ever since I first demoed the song in the fall of 2016 it’s been somewhat of a favorite, perhaps in big part because it’s one of a kind on this album, and I often find myself putting on the album from this song on (what would be side B if this was a vinyl record). The song probably draws some resemblance to tunes like “Rock and a Hard Place” (New Religion 2010), “Sweet Bad and Beautiful” (Riot Avenue 2012) and “Vodoo Woman” (New Religion 2010) but I think that’s mostly because of the overall beat and tempo of the song and maybe to a lesser extent because of melodic similarities. All in all, a fun and groovy rock song with a lot of attitude and a great and somewhat unexpected middle part. This was the very last song written for the album but once I had the demo recording of it done in early December 2016 I knew this was the kind of song that the album really needed to feel complete. The fact that Frontiers chose it as the second single along with the overwhelmingly positive response it has gotten since its release on march 10th just proves the effect I imagined this song would have. It has also grown to become the favorite song of mine on ‘Ruff Justice’. The song itself is built largely around a guitar melody that is a reworked version of a demo that Chrisse Olsson showed the band earlier last year. I always thought the intro part sounded really cool and when I started to get the basic idea of a chorus in my head I knew straight away that it would fit well with Chrisse’s guitar part. The final melody part is actually quite a bit different than how it sounded on Chrisse’s original demo but the overall feeling of it remains and helped shape the mood of the song as a whole. Production wise we’ve gone for a pretty scaled down sound with not a lot of distortion or heavy guitars but more focused around clean guitars, keyboards and roomy drums. Both melodically and sound wise it bears resemblance to songs such as ‘Blame it on Love’ (New Religion 2010) and ‘Children of the Cross’ (New Religion 2010) and once again the backing vocal efforts of Michael Palace (Palace) and Swan Hellion (Black Rain) help lift the chorus to new heights. A mid-tempo, melodic rock song built around a memorable guitar melody. It would come as no surprise if this song became one of the top three most popular tracks from this album. Track number 8 is the only real power ballad of the album. It revolves heavily around a nice plucked guitar part throughout large parts of the song and features a lot of memorable and emotional vocal melodies. It starts off really smooth with just vocals and guitars for most of the first verse and starts to intensify for the chorus, in which Michael Palace (Palace) and Lindis Botolfsen help out with some awesome backing vocal parts. The song itself has been lying around for quite a while and I recall first recording the main plucked guitar part and vocal melodies around 3 years ago. After that the chorus was added probably a year later and the final lyrics were actually just finished at the time of the vocal recording, when we’ve already recorded all the instrument parts for the song. I’m glad the guys trusted me enough to record it even if they’d never heard the words for it. This is overall that essential hair metal power ballad that every album of this genre needs, in my opinion. Musically, it should cater to fans of songs like ‘Only the Dead Know’ (Riot Avenue 2012) and ‘Children of the Cross’ (New Religion 2010) with it’s mellow and somewhat sad felling and minor scale melodies. The demo for this song has been floating around since early 2013 and I remember coming up with the chorus and the main riff around Christmas 2012, which makes it one of the older songs on this album. 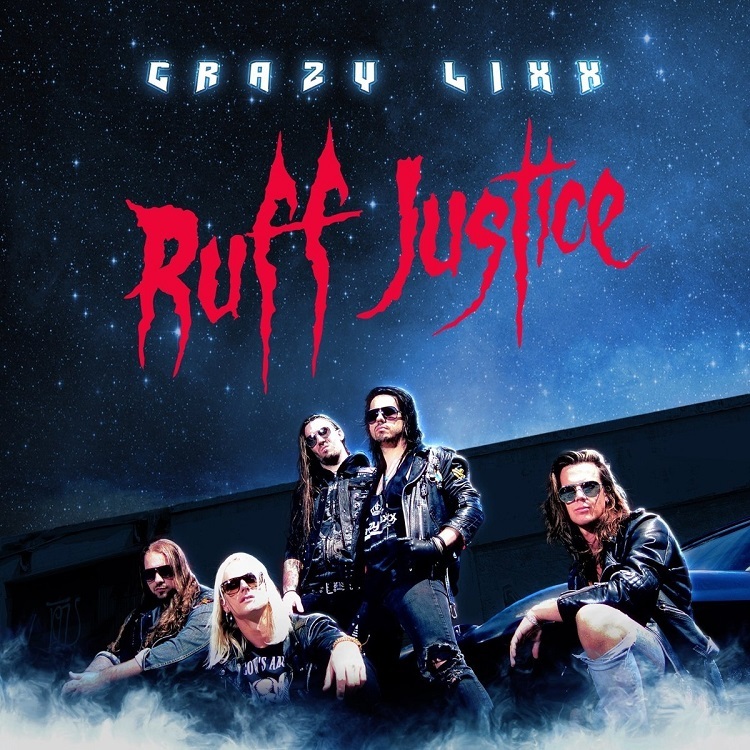 It was suggested for the self-titled album (Crazy Lixx 2014) but by a narrow margin wasn’t considered a good fit along with the other songs we already had and thus was binned, that is until we started looking at material for ‘Ruff Justice’ back in early 2016. I’ve always felt this song had a lot of potential and I think the production and guitar playing by Jens and Chrisse really did the song justice, so I’m happy it finally made it unto an album. This is an up-tempo, melodic metal song with a lot of Iron Maiden-styled twin guitar melodies, which probably isn’t what we usually do. The song changes key into the chorus which gives it a dramatic lift and adds a lot of power to it, along with some thick gang vocals by Daniel Almqvist (Aerodyne), Swan Hellion (Black Rain) and John Elliot (Confess). This is a guitar driven, straight forward melodic metal piece that should appease fans of songs like ‘Heroes Are Forever’ (Crazy Lixx 2014), ‘Riot Avenue’ (Riot Avenue 2012) and ’21 ‘til I Die’ (New Religion 2010). The last song on the album was actually the first one to be recorded, already back in 2015. After the departure of the previous guitarist pair, Andy and Edd and before Jens and Chrisse joined the band we had a bit of a down period and decided to record a new song to keep our minds on something else and to try out some new recording techniques and studio settings – the song was Live Before I Die. Now, since this was technically when the band didn’t have any guitar players, I did the rhythm guitar parts myself and then asked Andy (who had actually officially already left the band by then) to lay down the solo part. I also got Erik Mårtensson (Eclipse), Mats Levén (Candlemass) and Thomas Vikström (Therion) to help out with the backing vocals on the track. After it was done, it stayed unreleased, waiting for a good time to be used and that opportunity came along when we were contacted by GUN media in early 2016. They said they were working on a new Friday the 13th themed video game and wanted some authentic sounding 80’s hard rock music to use in the game. I immediately became interested and started to think about new compositions that would fit the style and theme of the game. Only problem was that the deadline for the song was quite tight since they wanted to use it for an early trailer for the game and there was really no way we could write and record new stuff in that time frame. So I told them we had this one song that hadn’t been previously used and that they could check it out and if use it if they liked it, but if they did we would then agree to write some custom written songs for the game. Well, it’s safe to say the enjoyed that first song and the rest is, as we say, history. A short, straight to the point, melodic, mid-tempo hard rock song reminiscent of Bon Jovi in the 80’s and early 90’s.